← The London Mayor’s Education Conference. Sebald in Corsica: ‘Campo Santo’. Campo Santo is one of four short pieces with Corsican settings in W.G. Sebald’s collection given the same title. These were fragments for a book about Corsica which remained unfinished at his untimely death in a road accident in 2001. 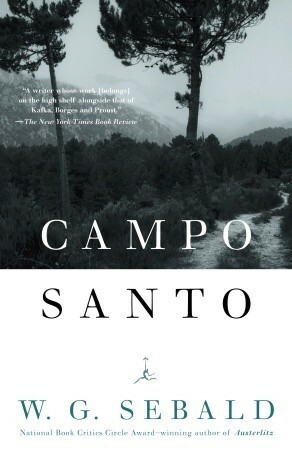 Campo Santo takes us from the author’s arrival in the village of Piana, starting with a swim in the bay of Ficajola below, a visit to the graveyard (Campo Santo), a riff on the Corsican way of death and the ultimate meaning of life. All in a remarkable 18 page single paragraph without a break in the flow of thought. Noticing an absence of very ancient graves, he later learns that graveyards only became common in Corsica from the mid-nineteenth century and that it took a while for their use to be generally accepted as people preferred to bury their dead on their own land, sometimes creating little memorials for them. And then there are the mazzeri or ‘dream hunters’ who were once a very real part of many Corsican communities. These were social outsiders by day whose spirits were said to move about rapidly at night compelled to bring death to animals within a dream world. These killings would then foretell a human death soon after. Sebald sees in this pre-Christian shadow-realm a possible manifestation of the Freudian idea that, to our unconscious, all deaths are the result of murder. Reading Campo Santo made me reflect on my visits to our own Corsican cemetery in Vero. It’s a short walk from the village, out of sight around the corner of the mountainside with a breathtakingly beautiful view across a wild interior valley. This ‘village of the dead’ is not a place of fear but a complement to the village of the living. It keeps its counsel and its distance but the graves and memorials serve to remind us of the life of an earlier village. Walking amongst the family groups, stopping at the graves of my beloved grandparents and those of other close relatives, I am remembering a whole generation and also connecting to the previous one; briefly encountered in childhood and learned more about second hand. Our visits are almost always in the dizzy heat of summer and in the solemn quietness of the pine forest the dead simply seem to be saying: ‘once we were the world, now it’s your turn’. Campo Santo is wonderful, but I want to rebel against Sebald’s final view of a future without memory. There is much that will be forgotten about us after we have gone but we have existed and will not be rubbed out. Each individual who has lived is part of the great fabric of humanity and each thread in that fabric has its importance. The ebb and flow of human civilization, wars, revolutions, political movements, the flow of people and ideas – all these are built on the lives of individuals, all of whom matter – however many billions they number. In the short term, I can see that there are plenty of reasons for pessimism, but when contemplating the longer term we should resist anything other than a narrative of human progress to which we all contribute. The residents of our own Campo Santo would expect nothing less. This entry was posted in Culture, Reviews and tagged Campo Santo, Corsica, mazzeri, Piana, Vero, W.G.Sebald. Bookmark the permalink.